카트만두, 네팔의 카트만두 피스 게스트 하우스 | 호스텔월드에서 예약하세요. 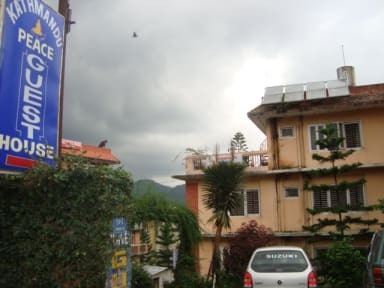 Kathmandu Peace Guest House is located in a quiet area; just 5 minutes walk from Thamel Tourist junction. 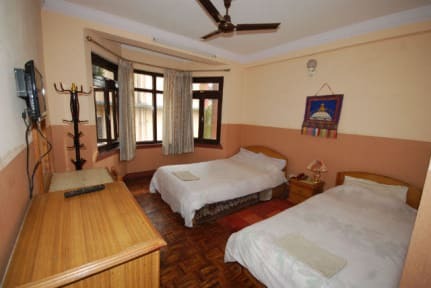 On the fringe of the Thamel, Enjoy your restful days in a tranquil ambiance of Kathmandu Peace Guest House. We assure you for the clean, safe, totally free of pollution and traffic noise accommodation. We provide accommodation at highly competitive rates. The bush green garden around the guest house is another attraction of it. Roof Top terrace providers relaxing environment, where you can enjoy views of the mighty Himalayas such as Mt. Ganesh Himal & Langtang etc. The famous Swayambhunath stupa and various monasteries dot the hilltop of Kathmandu valley. Take part in an additional luxury for yourself and indulge by shaking of your load and elevate your mood and spirit in the genuinely informal atmosphere at Kathmandu Peace guest house. The unique experience is one that you will long remember - the genuine Nepalese hospitality from our friendly staff as well as their homely atmosphere. Airport transfer available on request,If you need airport pick-up, After booking room please e-mail us with your arrival details;Name of airlines,flight No: and arrival time in Kathmandu airport. pick-up cost is US$8 to 12 depend on your arrival time ,We will tel you pick-up cost same time.